The procedure used here is intended to make a nice image for a poster or paper and to aid in understanding the morphology of the extended emission. 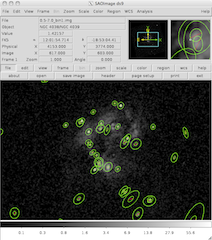 Point sources are identified and removed, filling the gaps with a sampling of the background region. The filled image is then smoothed, with the option to exposure-correct the results. Care must be taken in the scientific interpretation of the final image as it is highly processed. 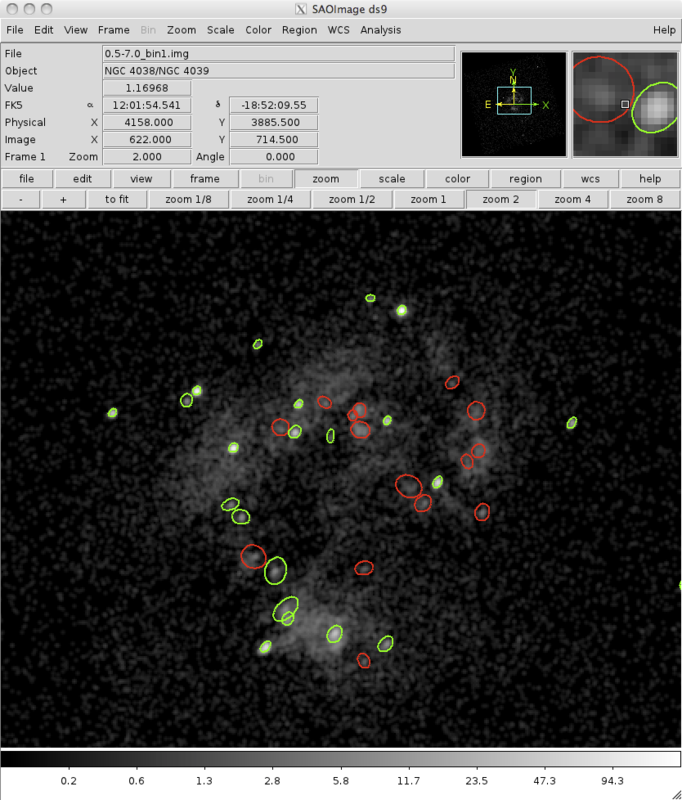 To create a smoothed image of diffuse emission, replacing point sources by a local estimate of the background emission. The File Format section of the Using CIAO Region Files: describes how to display region files on an event list, which is used often in this thread. Creating Source and Background Files: this method could be used to create the source and background region files as well. Last Update: 10 Dec 2018 - Updated for CIAO 4.11; fluximage can now be used to create the psfmap. The data is assumed to have been downloaded from the archive - e.g. 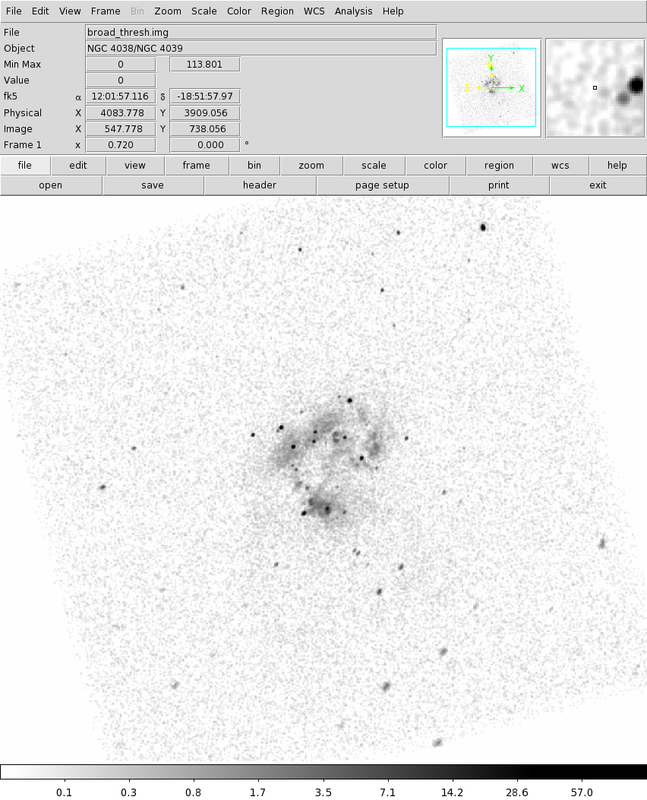 with download_chandra_obsid - then reprocessed using chandra_repro to use the latest calibration and software updates. The fluximage script now creates the PSF map needed by wavdetect when the psfecf parameter is specified. 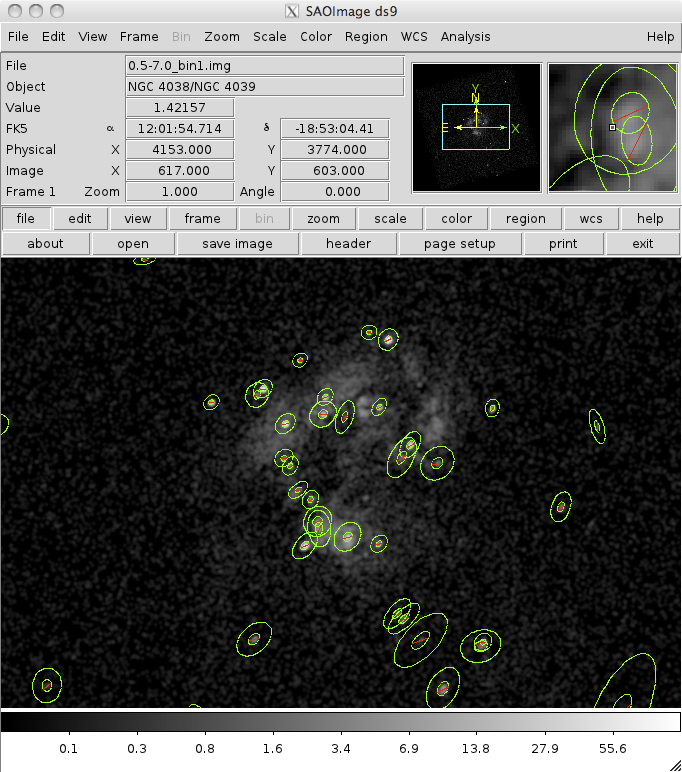 The output of psfmap is an image where the pixel values contain the PSF size in arcseconds for that region of sky. 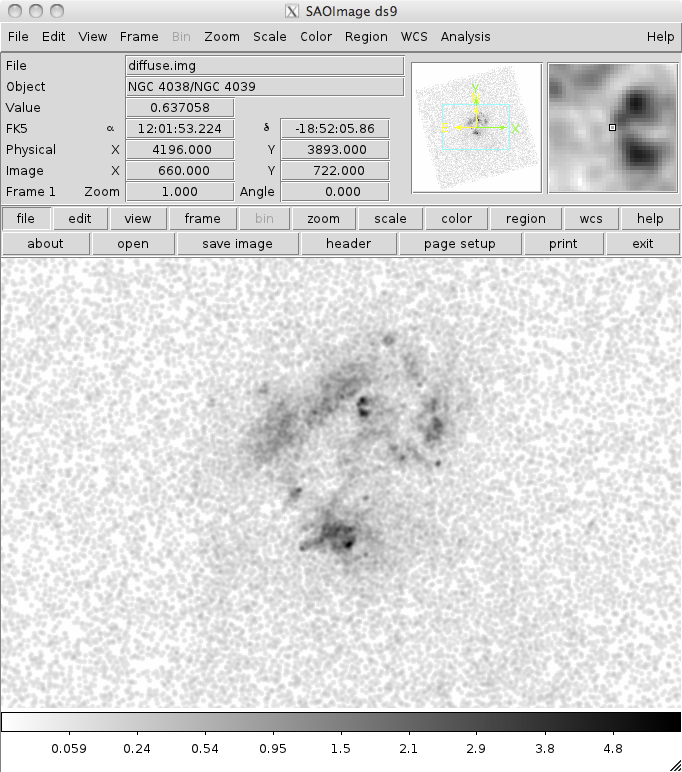 The last line, null:552452, indicates that there are pixels in the PSF map with a value of NaN, indicating pixels in the image that are outside the instrument field-of-view, FOV. chips cannot create a contour when the input image contains values of NaN, so the dmimgthresh tool is used to replace pixel values of NaN with 0. 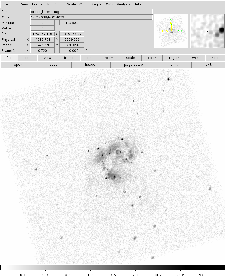 We have used dmstat and ChIPS to look at how the PSF map varies across the image; the contours in Figure 1 show the positions where the ECF is 0.5, 1, and 2 arcseconds (for the chosen energy and ECF fraction). The contours show the locus of the 0.5, 1, and 2 arcsecond radii for the energy and ECF values used in the mkpsfmap call, namely 1.4967 keV and an ECF of 0.393. 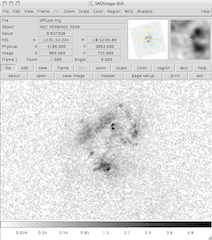 Throughout this thread, we will use the image created by fluximage, namely images/broad_thresh.img, and you may proceed to source detection with wavdetect; however, should you want to select the region and energies you are interested in, it may done using dmcopy and an events file - e.g. The ACIS-S3 chip is displayed. We can now run wavdetect to identify the point sources. Note that here we have chosen to increase the ellsigma parameter from 3 to 4, since we wish to make sure we excise as much of each source as possible from the image. This value should be modified to suit the requirements of your analysis. 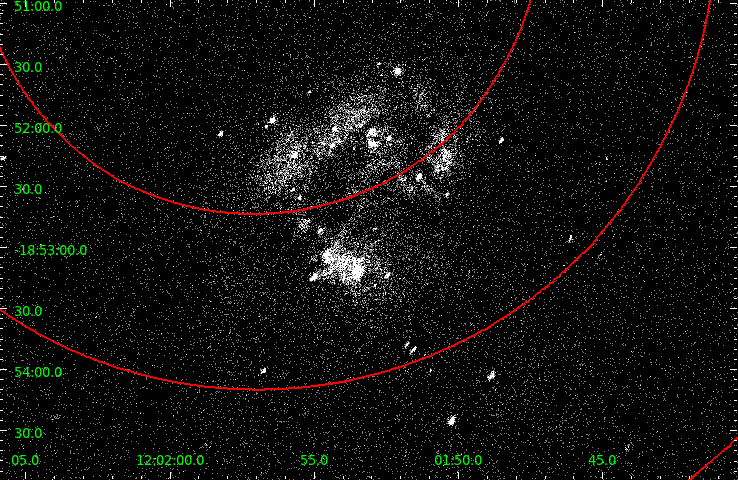 Similarly the scales setting should be adjusted to match the data. The contents of the parameter file may be checked using plist wavdetect. From inspection, one can see that many of the sources detected by wavdetect are not point sources, but clumps of diffuse emission. Scientific judgment must be used to modify or delete regions before saving the final region file. The Using the Output of Detect Tools thread shows how to display and modify source lists. The source list can contain overlapping regions since this case is handled by the roi tool used in the next section. The green ellipses show those regions we have decided to use (sources_mod.reg; i.e. these will be removed from the image). The red ellipses are the sources from the original wavdetect sourcelist (sources.reg) that we have decided to ignore. 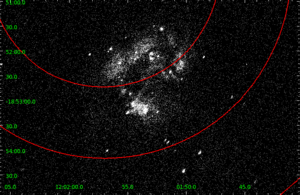 dmmakereg uses the wcsfile to convert the region from celestial coordinates (RA,Dec) to physical coordinate. It only does this if it needs to. If the input region is already in physical coordinates then the wcsfile is ignored. Simple numeric values without any annotation are treated as being in physial coordinates. A region in celestial coordinates will be recognized either by the use of colon separated sexagesimal coordinates, with the string fk5 preceeding the regions, or with the special "d" following the values to indiciate decimal degrees. More examples are shows in the DM filtering help file. In this example, the region is already in physical coordinates so no conversion is performed. and finishing with an optional validation and modification phase. The roi tool takes care of combining overlapping source regions and excluding neighbouring sources from background regions. The contents of the parameter file may be checked using plist roi. Note that we set the bkgfactor parameter to a small, positive value to ensure that the outer radius of the source region is smaller than the inner radius used in background region, since dmfilth can error out when these two boundaries are the same (Figure 4). 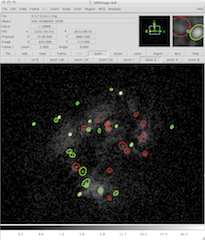 Since we set bkgfactor in the call to roi, we have ensured that there is some separation between the inner radius of the background (the green area) and the source region (the blue area). This is done to avoid potential problems in the dmfilth run below, since there may be pixels that appear in both source and background regions due to pixellation issues if the two radii are the same. 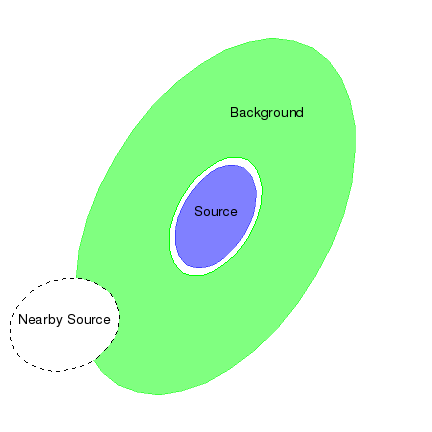 Also shown is the area excluded from the background region due the presence of a neighbouring source (the dashed ellipse). In this example we have barely scratched the functionality of roi. For instance, since the emission we are interested in is all contained within the S3 chip, we do not have to worry about the edges of the chip, and so we have not bothered to set the fovregion parameter. Similarly, as there are no bright sources in the field we do not use a streakregion file, such as created by acis_streak_map. Please see the ahelp page for roi for more information on this tool. The parameter file for roi is updated to contain the number of source created; here we have 58. This is smaller than the original number of sources (60) since roi has combined sources that overlap. This behavior can be controlled by changing the tool's group parameter. and shows a source region on the left which has combined two sources, and on the right its background region, which has multiple sources removed from it; these overlapping regions can be seen in Figure 3. The dmfilth tool used in the next section requires two files in ASCII region format: one for the sources, and one for the backgrounds. To do this we use the splitroi script, which is part of the CIAO scripts and modules package (although, as described at the end of this section, you can use sed, or similar tools, to create these files for you. We now have two ASCII region files - exclude.src.reg and exclude.bg.reg - that can be used by dmfilth. To view them in ds9 you need to convert them to FITS format using dmmakereg; e.g. Here we see the annuli used as the background for each source. For regions where the source density is high - making it hard to see what is going on - the individual region files created by roi can be used (e.g. Figure 5). At this point you can inspect these region files to select which ones should be used and which ones removed. For this example we do not make any changes. The tool dmfilth offers several options for extrapolating over regions (see the ahelp file for more information.) Here, we use the POISSON method, which assigns pixel values to the source region by sampling the Poisson distribution whose mean is that of the pixel values in the background region. This has been chosen for didactic purposes and may not be the best choice for your purposes (it assumes that the diffuse emission at the source has the same surface brightness as in the background regions which is questionable here for some sources, looking at Figure 6). The contents of the parameter file may be checked using plist dmfilth. The output file is shown in Figure 7. As expected, the point sources are no longer visible. The locations where point sources were removed have been replaced by sampling the local background. This image can be compared to Figure 2. The image file is smoothed via the tool aconvolve. A gaussian is used for the kernel specification (kernelspec) and the kernel is normalized by the area (normkernel). has a sigma of 7 pixels along each axis. Users will have to experiment with different kernelspec definitions to find the optimal one for the dataset. 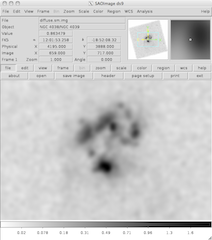 The contents of the parameter file may be checked using plist aconvolve and Figure 8 shows the smoothed image, diffuse.sm.img. The image has been smoothed with a gaussian kernel. 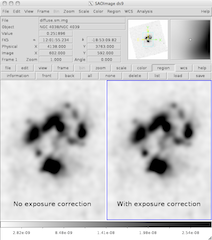 From this point, it is also possible to incorporate an exposure map in order to create an exposure-corrected image. Unless there are significant exposure variations across the field, this will not make a difference in the final image; exposure-correcting the data used in this thread did not have a visible effect on the output. If you used fluximage then you have an exposure map - in this case broad_thresh.expmap, otherwise follow one of the Exposure Map threads. In Figure 9 we show that, for this example, there are no major large-scale differences in morphologies in the two smoothed images. The left image is the smoothed counts image, the right side shows the smoothed exposure-corrected image. Both data sets were smoothed with the same gaussian kernel. (clobber = no)              Overwrite existing outputs? (log = no)              Make a log file? (targetbkg = all)             Make background around all sources or just target? (ignore_streaksrc = yes)             Ignore streak region for source list ? (clobber = no)              Remove existing output files? 09 Jan 2012 reviewed for CIAO 4.4: the thread now assumes that the data has been processed by chandra_repro, uses fluximage to create the necessary images, updated to use the new interface to wavdetect, and use the new tool roi and script splitroi to generate the source and background regions rather than the deprecated mkBgReg.pl and mkSubBgReg.pl routines; added Figure 9 showing the exposure-corrected version of the image. 24 Jul 2012 added clarifying remark to Identify and Remove Point Sources section. 03 Dec 2012 Review for CIAO 4.5; cleanup a bit of "new in ciao 4.4" related stuff. 25 Nov 2013 Review for CIAO 4.6. Highlighted fact that early mission data needs chandra_repro to update headers for parameter block keywords. 17 Dec 2014 Reviewed for CIAO 4.7. No changes. 03 Jan 2016 Review for CIAO 4.9. No changes. 19 Mar 2018 Added a note about region coordinate systems and added wcsfile to the dmmakereg command. 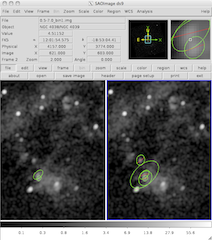 10 Dec 2018 Updated for CIAO 4.11; fluximage can now be used to create the psfmap.